A brutal Sunni-Shi'ite war is raging across the Middle East, and the Lebanese terror organization Hizballah, originally formed to wage jihad on Israel, now finds itself in the middle. Hizballah is a formidable component of the Middle East's Iranian-led Shi'ite axis. The axis is a transnational network of allies and proxies that once was focused on fomenting attacks on Israel. It still does that, but the axis is primarily engaged in an altogether different, day-to-day fight against Sunni organizations, as well as against the Sunni states like Saudi Arabia that back some of these groups. This war is raging in Syria, Iraq, Yemen, and other battlegrounds, and it has reshaped the Middle East, making it almost unrecognizable. For example, in the second half of the 20th century, Syria often would send military forces into Lebanon to dominate it. Today, Lebanese Hizballah formations dominate and shape events inside Syria. The radical Shi'ite axis is led by Iran's extraterritorial Quds Force unit, which answers directly to Supreme Leader Ayatollah Khamenei. The Quds Force arms and funds the Assad regime, and a series of militias and terror organizations that stretch across Iraq, Yemen, Syria, Lebanon, and even the Gaza Strip. An examination of some of the paradoxes that define Hizballah today sheds light on the new reality facing the Iranian axis. The first contradiction is one of capabilities. Hizballah is by far the most heavily armed terrorist organization in the world, yet it cannot use most of its weapons – a vast arsenal of 120,000 surface-to-surface rockets and missiles – in almost any of the battles it now fights against Sunni rebels in Syria. These weapons are reserved for use against Israel, and in any case, would not be very effective in the kind of counter-insurgency warfare Hizballah is fighting against irregular rebel forces. Additionally, Hizballah finds itself caught in a difficult political situation. It saved the Assad regime from full collapse, yet it faces pressure from Iran to send even more forces out of its home turf of Lebanon, and into Syria. This leads to a second paradox defining Hizballah today, which revolves around the issue of money. Hizballah's masters in Tehran have reduced the group's annual budget, and the organization is facing the fallout of a U.S.-led campaign to get Lebanese banks to stop working with it. Seventy percent of Hizballah's $1 billion budget comes from Iran, a decrease from recent years. Nevertheless, the budget enables Hizballah to continue building up a surface-to-surface rocket and missile arsenal that dwarfs most states. As a result of being stretched between Syria's warzones and positions in southern Lebanon, which were built for war with Israel, Hizballah, like its Iranian backers, currently is not interested in a war with Israel. 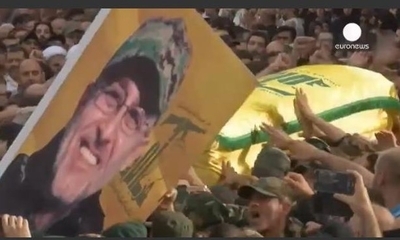 Hizballah has played down past recent incidents that could lead to conflict with Israel, and was quick to say that the assassination earlier this month of the group's operations chief, Mustafa Badreddine, was carried out by Syrian rebels, not Israel. It took Hizballah more than seven years to rebuild the southern Beirut stronghold of Dahiya after the 2006 war with Israel. Yet today, Hizballah, like the wider Iranian axis of which it is a part, is focused on its war against the Sunnis, who are bent on toppling Assad from power. The Sunni world is itself divided into pragmatic regional powers like Egypt, Saudi Arabia, and Jordan, and the genocidal ISIS and al-Qaida jihadists. The pragmatic Sunni elements have come to view Israel as a silent and highly valuable potential partner in a new regional realignment that is forming to fight both ISIS and the Iranian axis. Hizballah is bogged down in the Syrian mud, but it is also gaining invaluable combat experience. It has grown very close to the Quds Force through joint operations across Syria and it has learned crucial battlefield lessons. These include gathering intelligence, and organizing complex ground operations aimed at taking and holding ground. It even employs a large number of drones to assist ground units. Links between Hizballah's leaders and Quds Force commander Qassem Souleimani are very strong. All of this has come at a very high price. More than 1,500 Hizballah members have been killed in Syria, and more than 5,500 have been wounded, forcing the organization to set up costly rehabilitation programs for Syria veterans. Recent weeks have seen many Hizballah casualties fall in Syria. So far in 2016, it has lost over 60 members in Syria's war. Last year, it lost more than 540 fighters, and in 2014, around 360 Hizballah members were killed battling Sunni insurgents. In the past, when Iran feared that Israel might imminently strike the Islamic Republic's nuclear program, one of Hizballah's main roles was to deter Israeli decision makers from ordering a strike. Today, Iran views Hizballah as the powerful Shi'ite combatant that will defend Iranian interests in Syria against the Sunnis. For now, Iran is abiding by the Joint Plan of Action over its nuclear weapons program, opening up its economy to new investment, and flooding Iranian defense industries with cash for developing new weapons. Many of these weapons will end up in Hizballah's hands. Yet none of the above developments has caused Hizballah and Iran to give up their quest to destroy Israel. Iran has not given up on the goal of eventually acquiring nuclear weapons, and Hizballah genuinely believes it has a divine mission to destroy Israel one day. Despite the fanatical guiding ideology, Hizballah chief Hassan Nasrallah knows his ranks have been penetrated by Israeli intelligence to an unprecedented degree, and is disturbed by this fact. The day after Hizballah returns home from Syria, it will refocus attention on Israel or lose its justification for existing. Back in Lebanon, Hizballah controls a third of the Lebanese parliament – the country cannot appoint a new president without its blessing. Hizballah is more affiliated with the Lebanese state than ever before, and it once again enjoys the status as defender of Lebanon against ISIS's car bombs and horrors. Any attack on Israel today would cost Hizballah the ability to maintain positions in Syria, while also placing Lebanon itself in danger of becoming a ruined state. Hizballah has no choice but to place attempts to promote the ultimate objectives on hold.